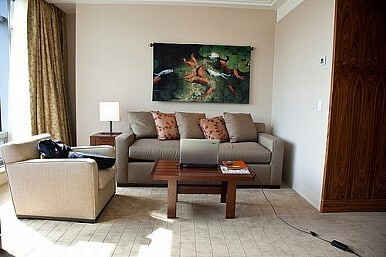 The new Shangri-La hotel in Vancouver has an interesting multi-cultural design flair. After nearly 30 years in business, Asia Pacific’s leading luxury hotel group Shangri-La Hotels and Resorts has headed out west. The group broke into the North American market last year with its debut hotel and residential property—the Shangri-La tower in Vancouver—and has made quite a mark while doing so. 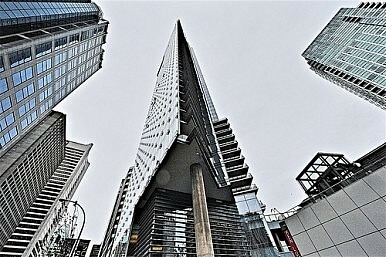 The sleek building is located right in the core of the Canadian west coast city and stands 62-floors high, making it the tallest in Vancouver and 11th in the whole country. And the company seems not to be stopping its international expansion any time soon, with properties in Australia, France, India, the UK and the US, along with another in Canada’s other major city, Toronto, all currently in development. Today, I had the chance to visit the Shangri-La hotel in Vancouver on my trip over here and I saw the current exhibit located in its unique outdoor art space. I also caught up with local interior designer Michael Ngui, who gave me some insights into what might draw international design aficionados and fans of the Eastern aesthetic to the Shangri-La spaces, using the Vancouver location as an example. He told me that the Shangri-La Hotel in Vancouver stands out as its interior brings a minimalist Asian aesthetic to the hectic business district of downtown Vancouver, perhaps bringing a sense of simplicity and calm to this busier part of the downtown core. Also, it has found a way to balance spare, clean-lined contemporary (and Asian-inspired) Italian furniture with traditional Chinese cabinetry in natural warm wood tones to create a soothing and serene retreat for its guests. He’s also particularly impressed with the ‘staggering’ piece of Chinese calligraphic artwork and the ‘ornate and massive’ crystal chandeliers in the hotel’s lobby, and pointed out to me that such visual marks signal arriving guests that their stay at the hotel will be one with a unique multi-cultural flare. Moreover, the Vancouver-based designer mentioned that all the while, the hotel has managed to pay homage to the West Coast Modern design aesthetic by offering soaring floor to ceiling views of the one-of-a-kind wealth of natural scenery outside. A rapidly changing nation, Sri Lanka could soon become a popular travel destination.